The rise of social networks like Facebook have increased the amount of information that users share with one another, while GPS-enabled smartphones give a constant record of where we are at any given moment. A new iPhone application called Highlight hopes to leverage all the data we are sharing and combine it with location data to help connect people who might have things in common. With the advent of smartphone and Facebook ubiquity and pervasive GPS services, Highlight CEO Paul Davison says that we now have more information about the people around us than ever before. However, there are few services that bring that data together and combine all the social and location data available to show us when our friends and friends of friends are nearby. There is Facebook, which lets us connect with friends and share information about our occupations, interests and loved ones. 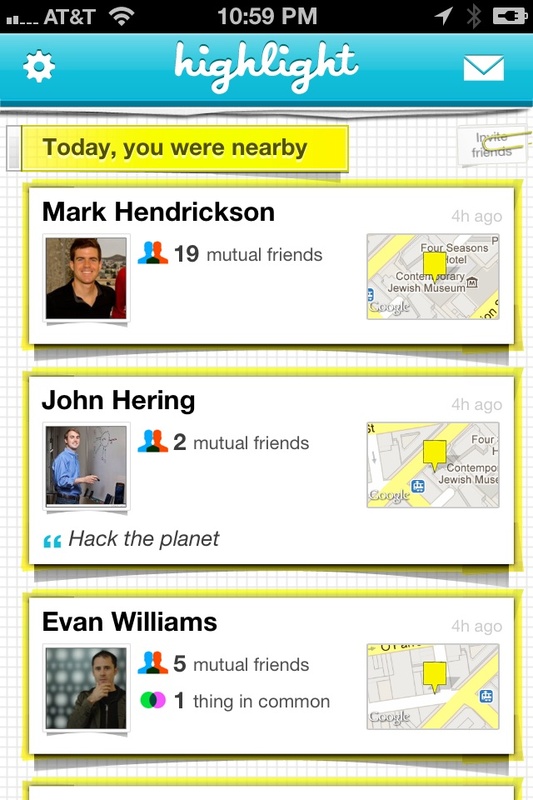 And there is Foursquare, of course, which allows its users to self-select when they share locations with those whom they have marked as their friends. But there are few tools with the ability to seamlessly provide real-time updates whenever a social connection — or a possible social connection — is nearby. Highlight hopes to create synchronicity in meeting people, to reduce the friction of introductions and getting to know one another if its users already know they have things in common. “I started with the idea that if you can just take two people and connect them, you can make the world a better place,” Davison told me last week. After downloading and installing the app, users connect their accounts with Facebook, add a few minor personal details . . . and then they sit around and wait. Or move around and wait. Either way, eventually users will be pinged when they get within a reasonable distance of someone they might know or someone their friends know on Facebook. 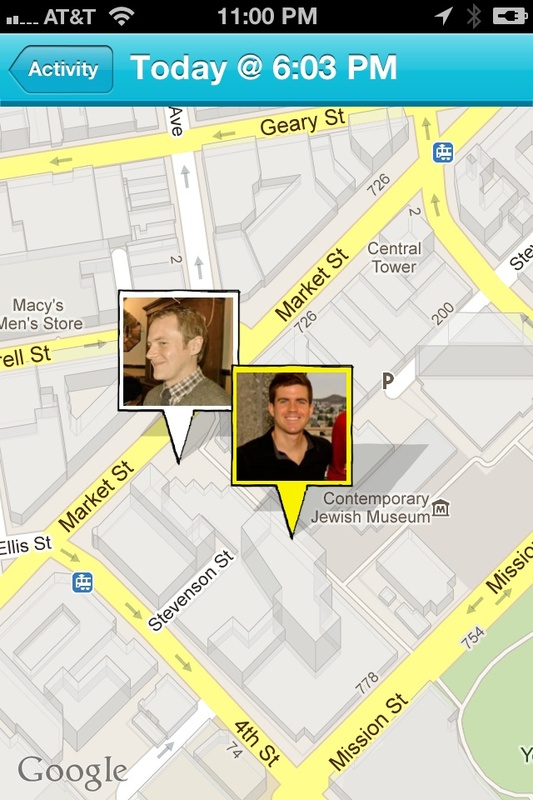 That might seem creepy, especially when the app pings you to say someone you have never met before is nearby. But Davison maintains that there are some interesting use cases. Imagine, for instance, that you met someone at a party or through a mutual friend and see them a few days later in a completely unrelated situation. If you were both Highlight users, the app would not only notify you that this potential contact was nearby but would also give you important information to help you strike up a conversation — the person’s name, for instance, which can be especially useful if, like me, you tend to forget names but remember faces. It would also let you know what that person’s occupation is and which friends you might have in common. The app seems perfectly suited for the San Francisco tech scene, where everyone seemingly knows everyone else, or should. And that is where it is focusing its beta efforts, trying to refine the proximity of how and when people receive notifications before expanding to other parts of the country. Davison notes that in San Francisco, letting you know that one of your friends is a couple of miles away probably isn’t very useful, but in smaller cities in the Midwest, where everyone drives everywhere, that kind of data could be useful (especially if you are both in town from other places). Of course, for Highlight to really become useful, it will need users to actually download the app and opt in, creating a sort of critical mass of connections. I was part of a closed alpha trial and received pings when a handful of people nearby. None of them were close enough to actually say hello, but a few had strong enough personal connections for me to have introduced myself if I were. It also needs a little tweaking when it comes to recognizing in which situations it should ping users. I found most Highlight activity occurred while I was on a bus or on my bike rather than when I was quietly seated at a cafe, where I might have had a chance to say hello to someone. As the app collects more data, it should be able to refine the experience. Finally, the persistent location tracking can be a battery drain, which was both my experience as well as that of colleagues that I had test it out with me. Constantly pinging location services in the background made my iPhone’s battery run down much more quickly than usual, causing me to need to recharge by the end of the day. Davison says that is something else that Highlight is hoping to optimize, for instance by recognizing when users have changed location and when they are sitting tight. If Highlight can tweak those things as it moves beyond its current hundred or so users to potentially thousands and tens of thousands, it could become a useful app for creating seamless real-life connections among people. Given how open users have become about the information they share, it seems like only a matter of time before Highlight — or something like it — manages to become the connective tissue between the social-local-mobile worlds. I would like to see this app allow you to post if you need help like fix a computer or take out the trash , etc and then will see if anyone who has this app and is willing to do it for a dollar amount, be able to be hired on the spot….. Make money quick seeing if anyone needed help in the vicinity of the person looking for help! I have to ask,have you checked out Zaarly? It does exactly what you’re looking for.